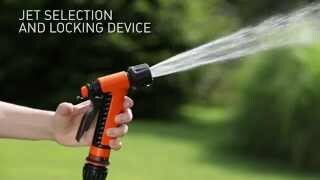 Spray pistol with ergonomic handle grip for all your irrigation needs. Compact and sturdy, easy and comfortable to handle, it allows you to adjust the water jet at any moment and to lock the position of the adjustment lever with a specific mechanism, preventing hand fatigue, especially in the event of prolonged use. Spray pistol with practical ergonomic grip. Water flow adjustment lever. Dual jet: from closed to open (jet or fan spray) selection device and lock of required jet. Pieces per pallet: 1080 pcs.